Now they return nearly two years later with more essential disco-house standards. "Ananas" gently ticklers the compressors as a wild guitar solo scorches its way through vamping horns and metallic slap bass. "Orient Star" is an exotic, Eastern-flavoured cosmic disco track that wouldn't sound out of place in a Mori Ra DJ set. Finally, "Dooga" is a slow-mo cosmic funk track featuring, again, hefty compression as a vibrant and multicoloured set of textures and instruments converge on the mix - making for a hard hitting, left of centre slow disco bomp that's worth the entrance fee alone! Long live the Take Away! Eccentric, California-based imprint Take Away has put out some impressive 12" singles since launching earlier in the year. 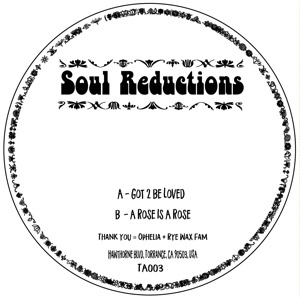 Predictably, this two-tracker from the little-known Soul Reductions is another stone cold killer. A-side "Got To Be Loved" - a bouncy, pitched-up disco-house floorfiller that sits somewhere between Tiger & Woods and late '90s "French Touch" house - leads the way, sounding like the kind of cut that will quickly raise the temperature out on the dancefloor. Flipside "A Rose Is A Rose" is a deeper and woozier offering, delivering a rolling house re-interpretation of a boogie-era electrofunk gem with added filter effects. Andre Sebastian, a young chef with musical ambitions, delivers our second offering. Two tracks with enough carbs to keep you going and a sweet treat to finish off the meal. Take Away delivers music for you breakfast, lunch and dinner. It's not trendy or rare. Just the music you really want to hear, in your own home, whenever you want. We know little of Ajvar Soundystem, but we always like an artist who comes through uninvited and accompanied by a new label. That's the way things should be. What we can say about Take Away 001 is that "Freak Hodja" is a glorious disco number with the perect balance of Arabic vocalism - a blend that is unfortunately not heard too often around these parts. "Roki" is faster, nuttier, and focusses more on the percussion elements, a zesty, freaky blend of drums and funked-out samples, while "Syfilis" is an absolute crowd-pleaser - a tune that you'll be singing along to without knowing a word or its meaning (unless you speak Arabic, of course).